A teenager complains of pain in the left wrist, yet manifests no localized swelling and exhibits symmetric bilateral range of motion. Read the full Clinical Challenge. HealthDay News — A child’s age, medical history, presence of other injuries, location and type of fracture, and possible fracture mechanism must be evaluated fully to determine if injuries are caused by abuse, according to a clinical report published in Pediatrics. Emalee G. Flaherty, MD, and members of the American Academy of Pediatrics Committee on Child Abuse and Neglect, reviewed recent advances in the understanding of fracture specificity, the mechanism of fractures, and other medical diseases that predispose to fractures in infants and children. They sought to help clinicians develop an evidence-based differential diagnosis to assess a child with fractures for physical abuse. Certain fractures have high specificity for or a strong association with child abuse, particularly in infants, the committee found. These fractures include rib fractures, classic metaphyseal lesions of long bones, as well as the less frequently seen fractures of the scapula, spinous process and sternum. The presence of multiple fractures, fractures of different ages and/or stages of healing, and complex skull fractures have moderate specificity for physical abuse. Other long bone fractures, linear skull fractures and clavicle fractures have low specificity for child abuse. 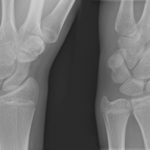 A radiographic skeletal survey should be performed in children younger than 2 years with fractures suspicious for child abuse in order to look for other bone injuries or osseous abnormalities. “When evaluating a child with a fracture, physicians must take a careful history of any injury event and then determine whether the mechanism described and the severity and timing are consistent with the injury identified,” the researchers concluded. Flaherty EG et al. Pediatrics. 2013; doi:10.1542/peds.2013-3793.